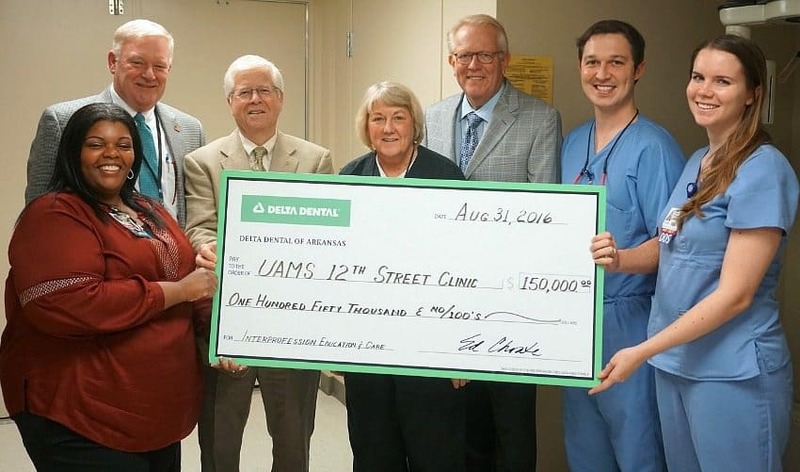 Delta Dental of Arkansas Foundation Executive Director Weldon Johnson, third from left, presented a ceremonial check to UAMS officials at the UAMS 12th Street Health and Wellness Center. Left to right, they are Lanita White, Pharm. D., center director; Dr. Robert Mason, board member, Delta Dental of Arkansas Foundation; Marcia Wheeler, D.D.S., assistant professor of dental hygiene in the UAMS College of Health Professions; Gene Jines, D.D.S., director, UAMS Center for Dental Education; John Pardo, D.D.S. and Alyssa Brailsford, D.D.S., dental residents, UAMS 12th Street Health and Wellness Center. Sept. 7, 2016 | Sept. 7, 2016 | The Delta Dental of Arkansas Foundation presented a $150,000 check Aug. 31 to the University of Arkansas for Medical Sciences (UAMS) 12th Street Health & Wellness Center to support dental care and encourage dental education and residency at UAMS. The three-year grant is Delta Dental’s second in 2016 to support dental care and interprofessional care at the 12th Street Center, following a $30,000 gift in March. Initially, there were no plans for an additional gift this year, Johnson said, but Delta Dental’s existing partnership with UAMS and the center created an opportunity to insure and expand inter-professional education and care activities.